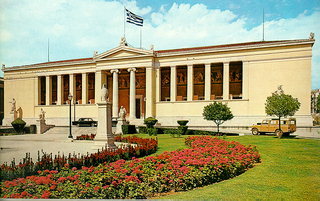 The University of Athens forms part of the so-called "Neoclassical Trilogy" of the City of Athens: Academy - University - Library. It consists of a group of built masses that shape up a double "T", with two symmetrical courtyards. The facade is strictly symmetrical to the arcade of rectangular pillars, set-off by an Ionian-style entrance. The bases of the columns and the capitals of the entrance are perfect replicas of the equivalent found in the Propylaea of Acropolis. The building follows the basic aesthetic rules of early Neoclassicism, while at the same time is adapted to the Greek Mediterranean climate. The outside statues complete the entrance's composition, that is evidently distinguished to "base," body" and "crowning" parts. Today the building serves as headquarters of the University of Athens, housing the offices of the Rectorate, the Juridical Department, the Archives and the Ceremonial Hall for official ceremonies of national esteem that refer to the University community. By a ministerial decree of 1952, the building was identified as preserved monument "in need of special protection" according to the relevant 1950 Law.